Where to go for a luxury family beach holiday?I’m always on the lookout for great family vacation ideas. And I love experiencing hotels that are well known for being the best family vacation resorts. 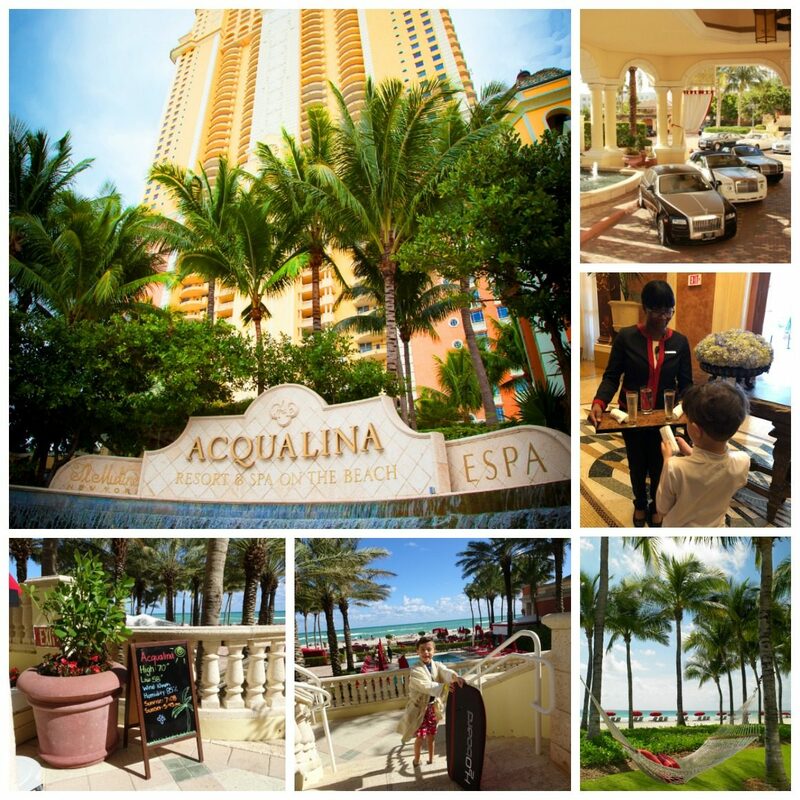 Acqualina Resort & Spa on Sunny Isles Beach has been on my radar for a long time. 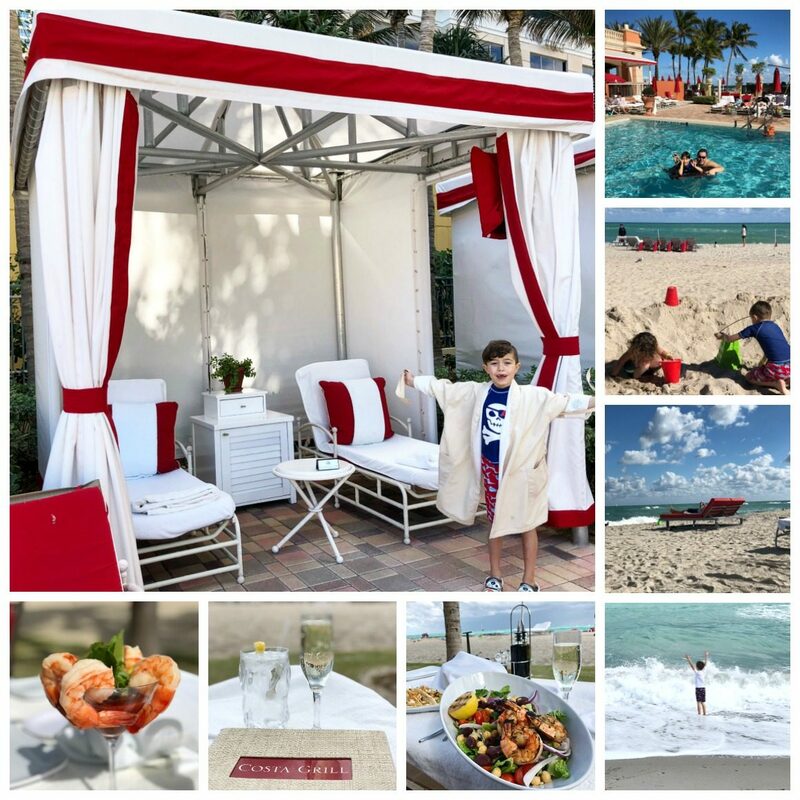 I’ve had so many friends who’ve raved about visiting Acqualina with kids during the winter holidays and spring break. 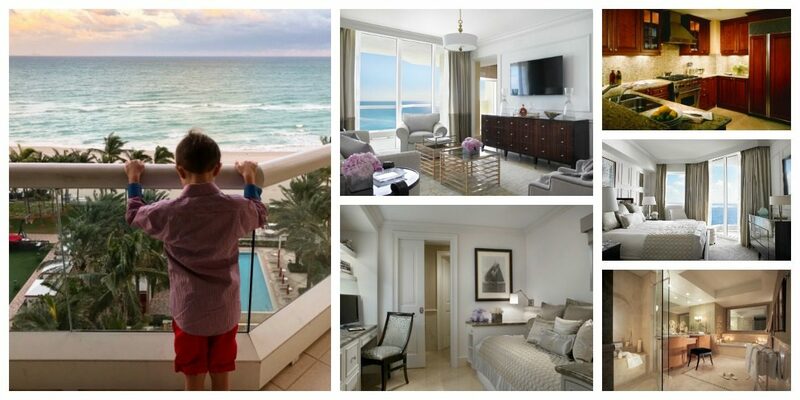 I love planning a new family adventure so I booked us at the Acqualina to celebrate my January birthday. Disclosure: We were guests of the Acqualina Resort and Spa for purpose of this review. We had an amazing luxury family vacation that we will always remember. We cannot wait to return! As always all opinions are my own. By January in Chicago, I am so over the winter snow. We are all ready to hop a flight and get started celebrating my birthday in in the warm winter sun. I know that a fun family trip to Miami is exactly what our family needs to warm our nearly frozen bodies. Our car told us the temperature was only 7 degrees when we left Chicago for Miami. We began to feel human again when we arrived at Acqualina to 70 degree weather and the sun was shining brightly. As we sipped champagne upon check in I knew we’d found our perfect family vacation! The friendly staff kept apologizing for the unseasonably chilly weather. Laughing we assured them that 70 degrees and sunny felt like heaven compared to home. Still enjoying our champagne we toured the resort in awe. Everything is SO gorgeous here! The hotel is a lavish Mediterranean Villa set on the most stunning stretch of Sunny Isles Beach. WOW just WOW! Everything about the beach is so lovely. The green of the grass lawn combined with the red furniture makes the blues of the ocean appear even more brilliant. We took one look and couldn’t wait to go play together in the warm soft sand. Let the luxury family beach holiday begin! We love luxury family resorts. And the anticipation of opening the door to our hotel room to the surprise of seeing our room for the first time is always a little rousing. It was love at first sight as we opened the door to explore our one bedroom oceanfront suite at Acqualina. 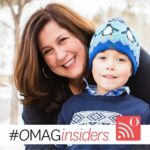 My 7-year-old son Harry was the first to run in and yelled out “Mom! We have 2 bathrooms and 4 TVs! !” He made himself at home in the little den off of the entry hall and plopped himself on the Daybed. He immediately turned on his tv and declared the den his bedroom. Harry was home! He relished having everything he needed in life all to himself in his own little room. My husband and I walked in and headed straight for the floor to ceiling sliding glass windows. The oceanfront views from our room were hypnotizing. We walked outside and stood on our long private balcony in awe of the beauty below us. Inside our suite, everything was impressive and fabulous. Even beyond our sublime views, our suite was very luxurious. I adored everything from the fabulous comfy bedding on the king-size bed in our bedroom, to the elegant furnishings in the living room. And WOW our room also had a fantastic full kitchen complete with wolf and sub-zero appliances. Our dining room table was perched in a bay window with gorgeous ocean views on 3 sides! We had so much space to relax and unwind as a family, we wished we were staying for a month! 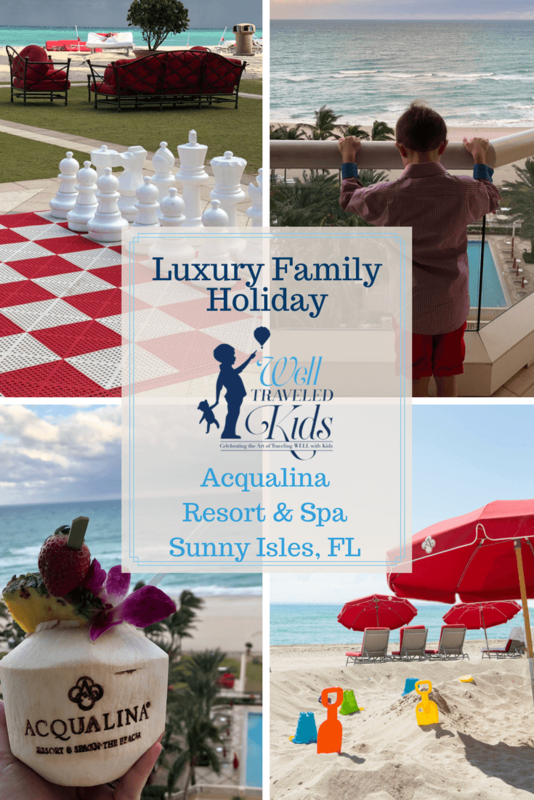 Acqualina totally anticipates what families need to make a stay easy and joyful. For instance, instead of a typical mini bar we were pleased to find our fridge stocked with all sorts of beverages, a basket of great beach snacks and a freezer stocked with little individual Häagen–Dazs® Ice Cream. Although these items weren’t complimentary for guests they are a huge convenience for families. Especially those who want to make use of the beautiful kitchen but don’t have a car on property to head out for groceries. I love when hotels leave a special little gift in the room for guests to take with them when they depart. I delighted in finding 3 complimentary novels stacked on my bedside table to grab and enjoy at the beach or take home to read. These page turners entertained me while lounging on our ocean front balcony, by pool, the beach, and on our flight home to Chicago. Most of all, my favorite little extra is the luxury spa bath products by ESPA in the bathrooms. I was first introduced to ESPA years ago at The Peninsula Hotel Chicago and have been hooked ever since! ESPA products are my absolute favorite and Acqualina is the ONLY luxury hotel in America to offer them in each room to guests. Also the staff were always bringing by little extras to enhance our day. On my birthday they emailed me a birthday message, brought me a champagne cocktail, birthday cake, and a card signed by all of the pool staff. Then they led everyone around the pool to sang happy birthday to me in the pool. It was so touching and really made my day extra special. At the beach, the Acqualina team goes above and beyond to make playing in the sand extra fun for kids. Every morning they rake the sand and build a big sand pit for kids to play in. They furnish tons of sand toys so kids can jump right in and get to work to build a masterpiece sand castle. We were truly treated like royalty on our luxury family beach vacation. Acqualina Resort AcquaMarine Kids Club Rocks! Harry fell in love at first sight with the AcquaMarine Kids Club. He was welcomed with warm smiles from the awesome staff and he didn’t hesitate to spend the day there. He loved doing arts and crafts projects and making friends in the club. Throughout the day we’d regularly spot him out playing on the beach, in the pool or playing soccer with lots of kids. I loved how each day they learned about a new sea animal and talked a lot about conservation of the ocean. Harry had a blast! 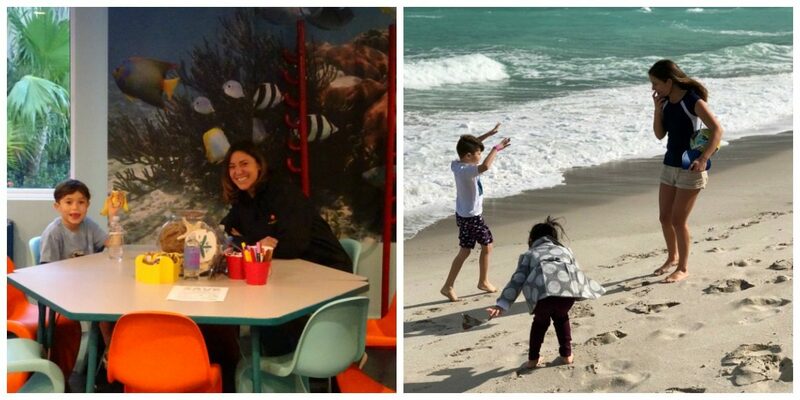 While Harry was playing with new friends at AcquaMarine, my husband and I headed to ESPA. 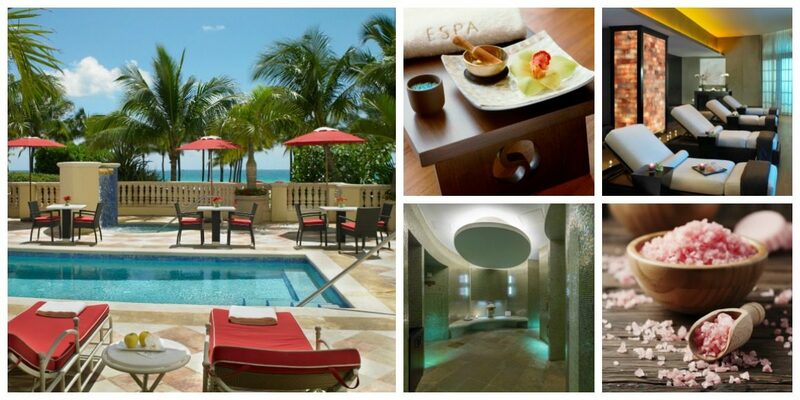 This spa is a MUST VISIT for any luxury spa enthusiast vacationing in Miami. My husband and I were totally amazed by the gorgeous spa and all of the treatments offered. We loved the coed outdoor relaxation area with a private pool, hot tub, and loungers. Each afternoon we had our own little romantic spa getaway while our kid was downstairs having the time of his life at the kids club. The spa treatments were outstanding. I highly recommend the Himalayan Salt Stone Massage. It’s AMAZING! The treatment compliments the Himalayan salt walls located in the women’s and men’s relaxation lounges nicely. I loved relaxing after my treatment next to Himalayan Salt walls. These walls fill the rooms with detoxifying negative ions that purify the air naturally. I felt absolutely fabulous afterwards! We love to play together at the pool and the beach. So, we booked a cabana by the beach pool on my birthday and we had a blast celebrating there! The best time for soaking up lots of sun at the pool is in the morning. So, we started my birthday playing together in the pool and lounging in the cabana. The cabana came with our own section of lounge chairs, a fridge, safe, and TV. It made for a perfect home base where we could easily go back and forth from the pool to the beach and know our stuff was locked away. There were lots of other families with kids at the pool and beach that day so it was tons of fun to play and make friends. After lunch the best sun was on the beach, so we moved over to our red beach loungers and relaxed while Harry built sand castles. Eventually he grew board of hanging with us and opted to head back to the kids club. We had the most fabulous ocean front lunch at Costa Grill. This is the resort’s beach restaurant that is exclusively reserved for resort guests, residents and beach club members only. You can’t beat this beautiful beach dining experience. We sipped champagne and enjoyed a delightful lunch. I highly recommend the greek salad with shrimp. It was outstanding! Throughout our stay the service was excellent and always personal. And, by the end of our trip everyone seemed to know us by name. The resort is incredible and makes for the ultimate beach address. That’s why it makes perfect sense to me that so many people who come to stay at Acqualina purchase a luxury beach residence here. The resort has 3 options for residences. The Residences at Acqualina, the Mansions at Acqualina, and coming soon are the Estates at Acqualina. I had the pleasure of touring the elegant spec model for the Estates at Acqualina. It is GORGEOUS! The Estates at Acqualina is the newest project that will feature lobbies designed by Karl Lagerfeld and exquisitely designed ocean front residences in a luxury resort atmosphere. 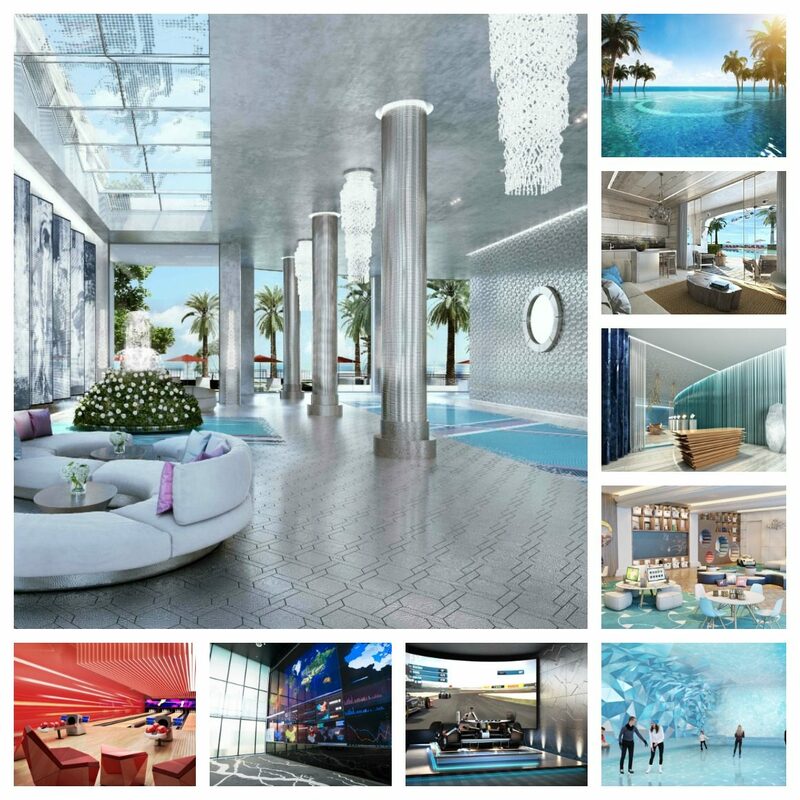 When completed the Estates at Acqualina will have an incredible amount of luxury amenities. Residents will enjoy an ice rink, a bowling alley, a golf simulator, and formula one racing simulator to name just a few. Families will love playing at the beach, pools, basket ball court, soccer field and the surf simulator. Parents can drop the kids in the kids club and head off to relax at the spa or work in the Wall Street Trade Room. If you have planned an Acqualina vacation, I highly recommend taking a tour of the spec model home while staying at the resort. If you are lucky, you will be their next resident! 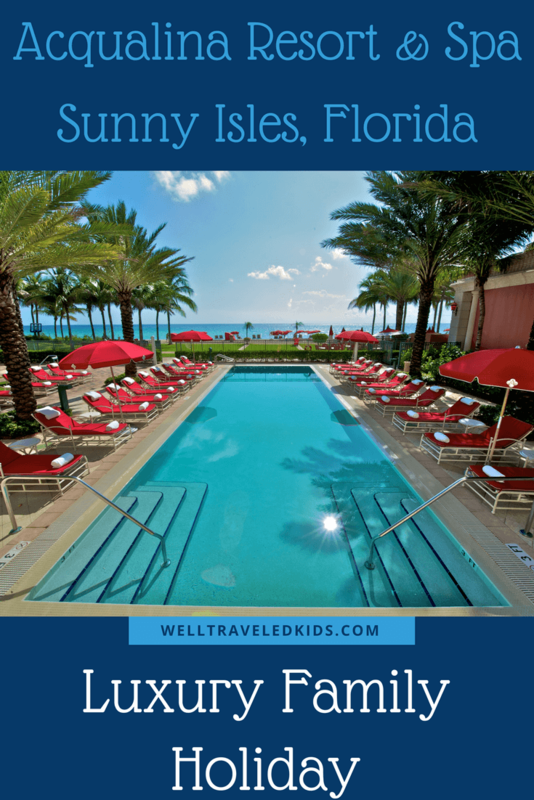 Acqualina Resort Tops my list for best family vacation resorts! Take me back to Acqualina!!! We are back home in Chicago now filled with warm memories of our luxury family holiday in Miami. I loved celebrating my birthday at Acqualina and would thrilled to do so again next year! We all agree its tops on our list for best family vacation resorts. We took full advantage of all the options for awesome things to do together as a family at the resort and we also all enjoyed some fun time apart. Having opportunities for both is what made this luxury family beach holiday so fabulous. I highly recommend this resort for families looking for an amazing luxury travel experience in Sunny Ilses Beach! Great Article on Acqualina Resort, looks impressive! What an amazing time you must have had! I am a grand dad who wants to start taking his whole family on a family vacation each year to a luxury resort for young kids. Our grand kids are 3, 2 and 1. So they are real young.. I see you suggest boca and acqualina and I am sure there are others. We live in NC so for our first total family trip I need to be able to fly direct from Raleigh, NC. I do not want to mess my first family trip up ! Can you suggest some nice places where each family unit can have there space and me and grandma can find our space as well, Thanks for helping me as I find this a little difficult to plan as I do not want any bad surprises. thanks!! What fun! I think you’d really love Acqualina if you are looking for lots of space! We had a huge kitchen and living area and really fell in love with everything!